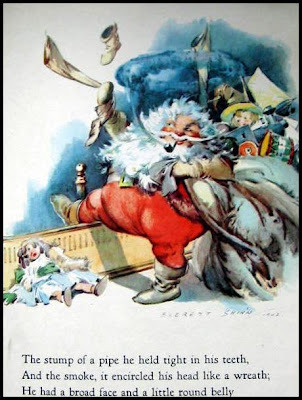 My childhood notion of Santa Claus was largely formed by images from the Everett Shinn illustrated edition of The Night Before Christmas. Here are a few of those images, snagged off the web. My own copy of the book -- the same that was read to me as a child, is ragged, torn and marred by repairs done with yellowing scotch tape. Some day I'd like to own a nicer condition copy -- but I think I'll hold on to that ragged copy no matter what. 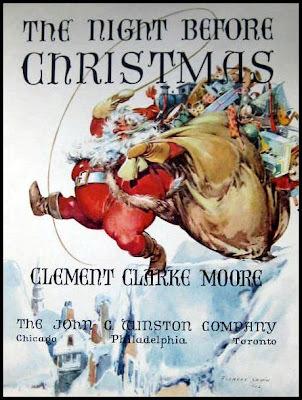 i too have a ragged copy of the night before christmas.My mom would read it every xmas eve, and now i read it to my children.It may be old, and torn, but it is still loved just the same. Thanks for the pics. 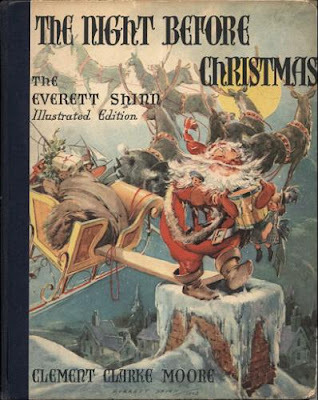 I was trying to track down the edition my mom used to read to us (which she received when she was a kid). This is the edition.